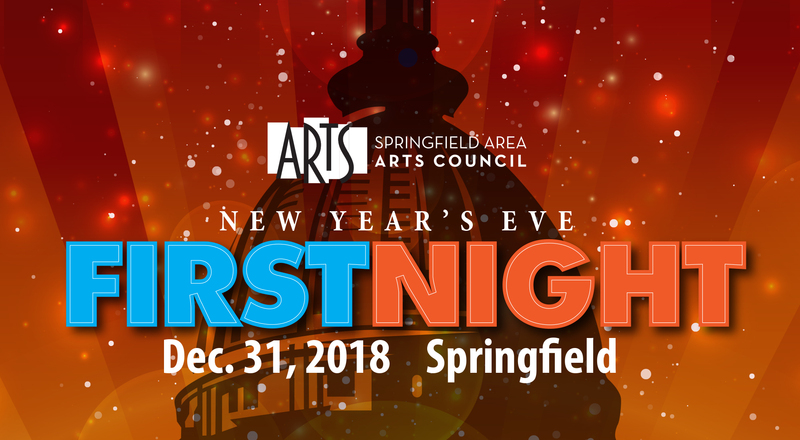 This year’s First Night Springfield is the city’s 32nd annual New Year’s Eve Celebration of the arts, presented by the Springfield Area Arts Council on December 31, 2018. First Night originated in Boston in 1976 as a family-friendly New Year’s Eve celebration. Springfield’s First Night was the first in Illinois and remains the longest running. We will open First Night events on the afternoon of New Year’s Eve—Monday, December 31—with FREE children’s hands-on creative activities and entertainment in three areas from 1:00 to 4:00 PM at Springfield High School. First Night also has a dedicated venue for teen bands at the Black Sheep Cafe Stage at Kari Bedford Photography, 314 East Monroe Street. The Black Sheep Café has established itself as a popular spot for young people in Springfield, presenting innovative music by local bands. The traditional First Night fireworks display will begin at 8:00 PM at Fourth Street and Capitol Avenue. Sponsored by Horace Mann, the fireworks are designed by Nostalgia Pyrotechnics under the direction of Carl Steinmacher, and he produces a great display each year. Following the fireworks, we will begin the next round of First Night performances at 8:30 PM. We will wrap up the event at 11:15, so that attendees will have time to get home or to a favorite spot to ring in the New Year. First Night admission wristbands : For adults, the cost is $18 when purchased before December 30th or $20 at the door. Tickets are $5 for children ages 5 through 18. Wristbands are available in-person at the Hoogland Center for the Arts box office or online. Black Sheep Café 6:30 p.m. – 11:00 p.m.
Springfield Poets and Writers 6:00 p.m.
Top Hat Tellers 7:00 p.m.
All-inclusive Stage and Gallery 5:00 p.m. – 11:00 p.m.
Lowder and Manning 6:00 p.m.
Debbie Ross Band 5:00 p.m.
Square of the Roots 8:30 p.m.
Springfield Dance Theatre 6:00 p.m.
Springfield Ballet Company 7:00 p.m. The Gold Center Treasure Box Drawing 9:15 p.m.
Springfield Theatre Center 9:30 p.m.
Springfield Dance Center 1:00 p.m.
Dance Party w/ Sesame Street Characters 2:30 p.m.
Richard Landry and Snowball 5:00 p.m.
Central Illinois Irish Dancers 6:00 p.m.
Capital City Improv 7:00 p.m. & 8:30 p.m.
James Edward Snow 9:30 p.m.
4th Street & Capitol 8:00 p.m. Performances scheduled for the Lincoln Home Visitors Center have been moved to First Presbyterian Church (at the corner of Seventh Street and Capitol Avenue). Same musicians and same times, just a different place. The Lincoln Home National Historic Site is closed because of the federal government shutdown. Happily the kind folks at First Pres have opened their lovely red doors to us.